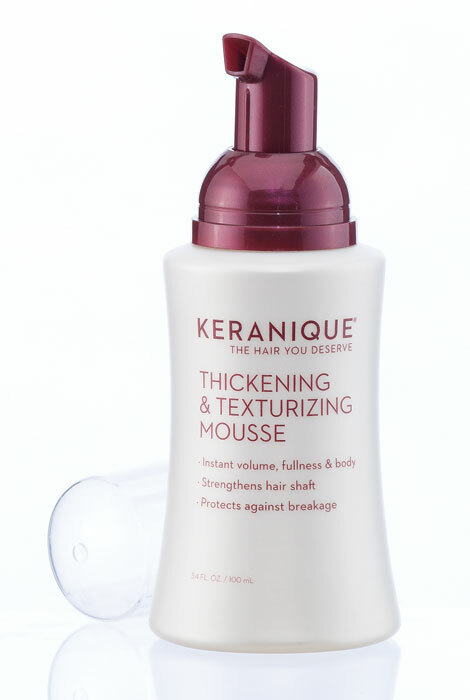 Protect your hair from heat and styling appliances while you add fullness and volume with Keranique® Thickening and Texturizing Mousse. The fortifying hair volumizer provides thermal protection, acts as a detangler, and helps hair feel smoother to the touch. Hair is easier to brush and springs to life with body. Scientifically blended to maintain volume without adding stiffness or stickiness, this mousse helps restore hair’s moisture balance for less breakage while brushing. Pump foam directly onto towel-dried hair and scalp. Massage quickly through hair from roots to ends of hair and into scalp. Do not rinse. Style hair as desired. For best results use daily after Revitalizing Shampoo and Conditioner. Water, Propylene Glycol, Stearamidopropyl Dimethylamine Lactate, Glycerin, PVP/VA Copolymer, Polyquaternium-55, Polysorbate 20, TEA-Lauroyl Keratin Amino Acids, Silk Amino Acids, Keratin Amino Acids, Collagen Amino Acids, Fragrance, Menthol, Peppermint (Mentha Piperita) Oil, Phenoxyethanol. My 1st purchase of this item. I hope it will give my hair a thicker appearance. Because I use this product all the time. First time to order...will let you know after I use it. I Love this mouse, the best I have ever used ! After reading that minoxidil does in fact stimulate hair regrowth I started studying products and reviewing the reviews as to their effectiveness. Keranique appears to be highly rated so I am trying it. I have used other keranique products and was pleased so I thought I would give this a try.